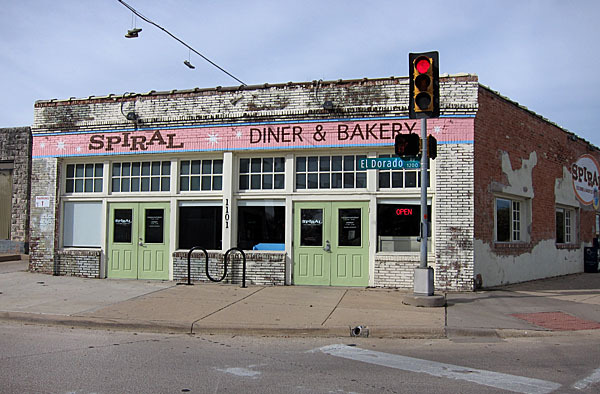 I’ve been making regular trips to Austin for almost a decade, and I’ve always enjoyed exploring the vegan dining options in a city that prides itself as such a cultural hot spot. My close friend in town keeps an eye out for new places to try when I visit. Last year, he came up with what I initially considered an odd choice. I admit I was hesitant to give this place a try, but I became an advocate after my first visit. 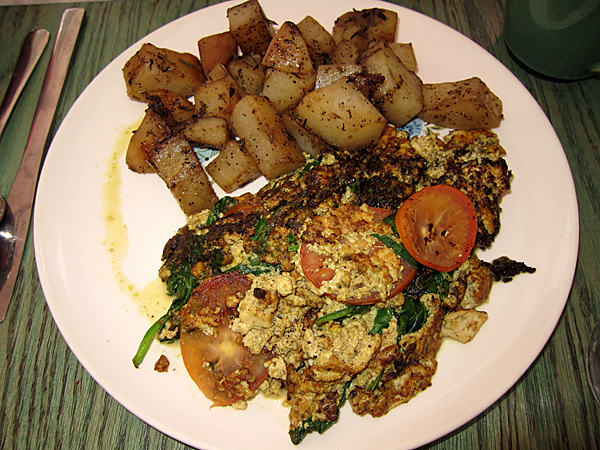 Casa de Luz is a healing center that offers a set meal for breakfast, lunch and dinner. It’s always vegan, always gluten free and always made with whole, unprocessed foods. 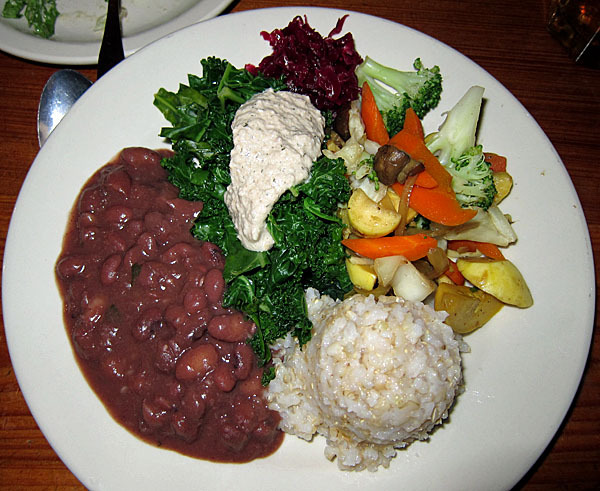 They provide soup and salad a la carte, then serve up a plate of beans, grains and vegetables. The specific ingredients and recipes change every day, as do the unique sauces and dressings. They post the menu online daily. This may sound like a boring meal, but trust me, it’s not. 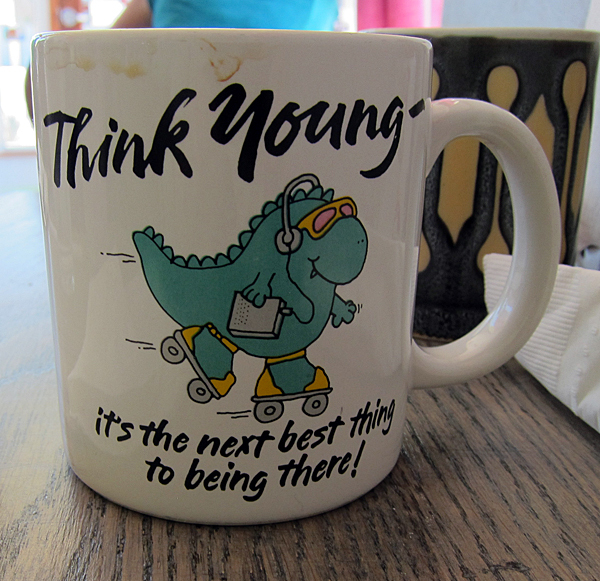 In fact, it may be, quite possibly, the best thing ever. 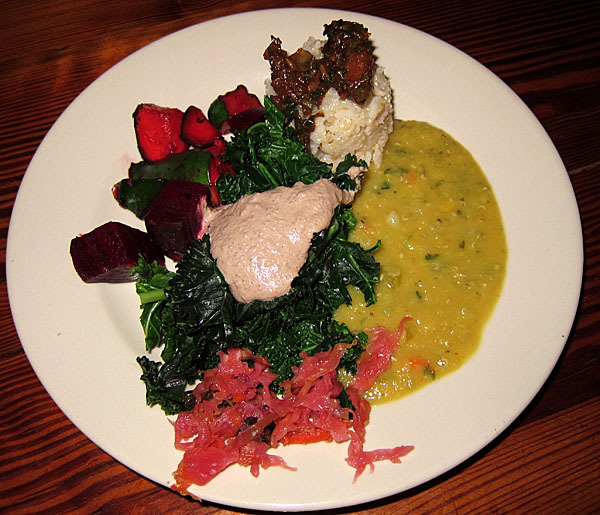 When I visited a year ago, the dinner included beets, lentils, rice, Kim Chi and kale (with an oil-free sauce). The lentils were beyond heavenly. 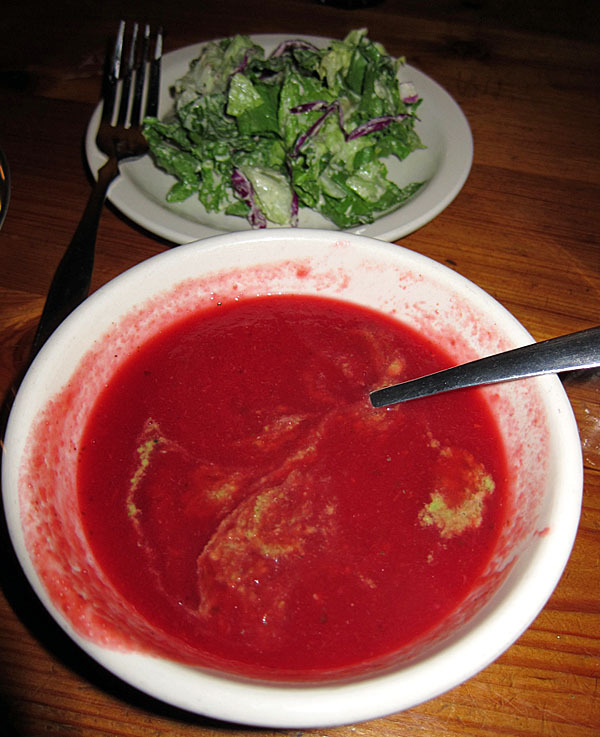 On my most recent visit (on December 26, 2012), the meal included a borscht (pureed beet) soup with an almond pesto sauce and salad. Again – it sounds boring but it was fantastic. I especially liked how well the almond sauce blended with the soup, giving it a bit of texture and zing. The creamy (yet vegan and oil-free) “Pepita cucumber” salad dressing had my husband going back for seconds. The meal consisted of medium and short brown rice; kidney and black beans; steamed mushroom, carrots, onions, broccoli and yellow squash; blanched greens (kale) with a balsamic, sunflower and dill sauce; and pickled red radish. I can’t think of a better meal after a heavy Christmas dinner. If I lived in Austin, I would probably have to move into this place. 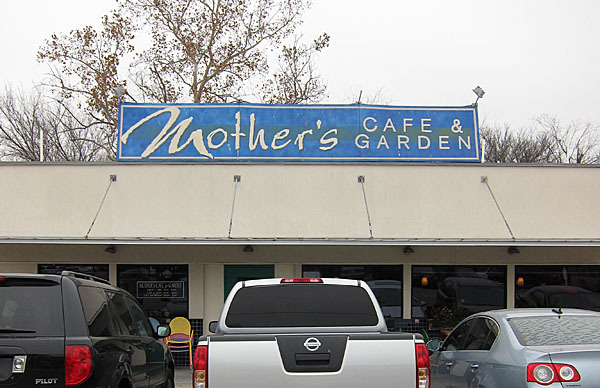 Mother’s Café & Garden is my other must-visit Austin staple. 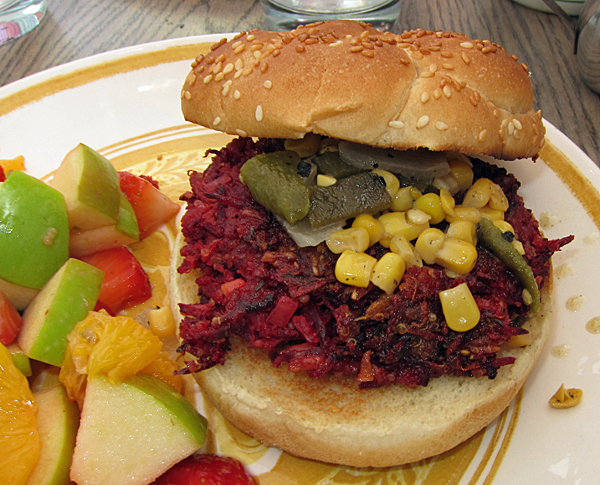 Its diverse menu of vegan and vegetarian favorites offers something for just about everybody in the family. The chips and salsa are highly edible (I think we ate four baskets full), and the fresh-made salsa has a lively Texas kick to it. To start, I ordered a cup of vegan tortilla soup. It was so good I forgot to take a picture until it was gone! I’d highly recommend it. My entrée was the Chili Melt. 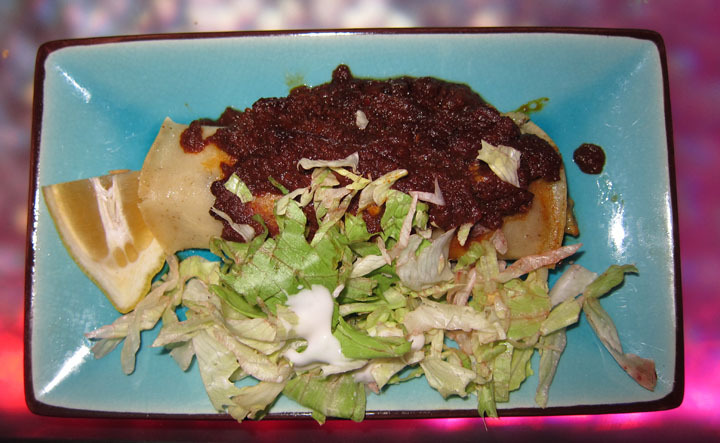 It was fairly basic flat enchilada with black beans, rice and corn tortillas. I chose the verde sauce, which was sweeter than I like for my Mexican food. 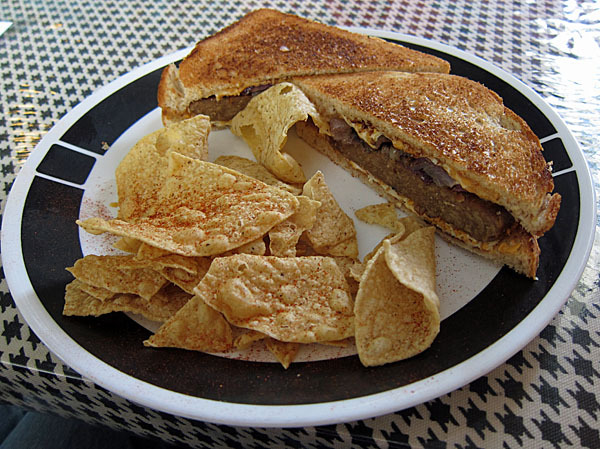 However, they have discovered Daiya vegan cheese, so that made it just right! My husband’s “TLT” was a bit less fun. 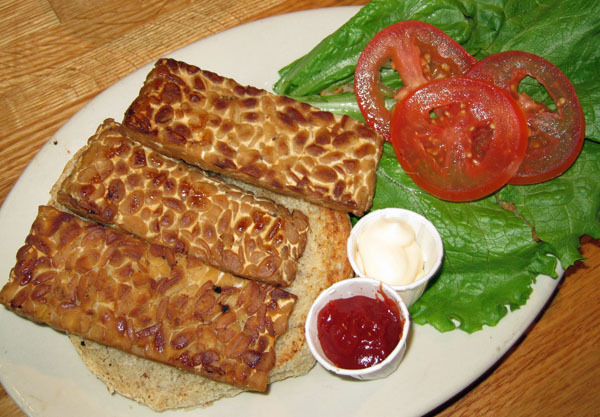 It was a simple sandwich of marinated tempeh with lettuce, tomato and Veganaise. 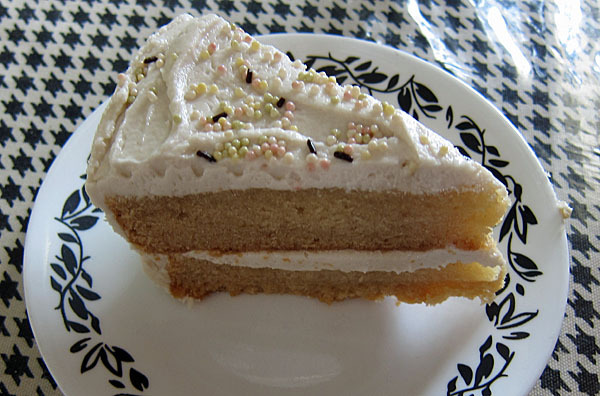 However, it left him with enough room for some vegan Belgian chocolate cake. 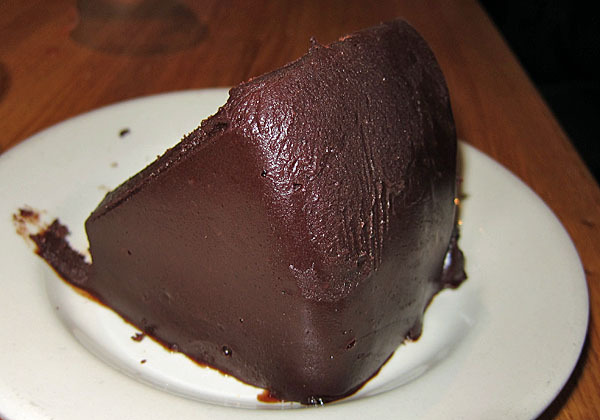 Mother’s has a wide variety of vegan treats, but the chocolate cake always calls to us. It’s rich and fudge-like. I’d recommend they serve it with some vegan vanilla ice cream and hot chocolate sauce! 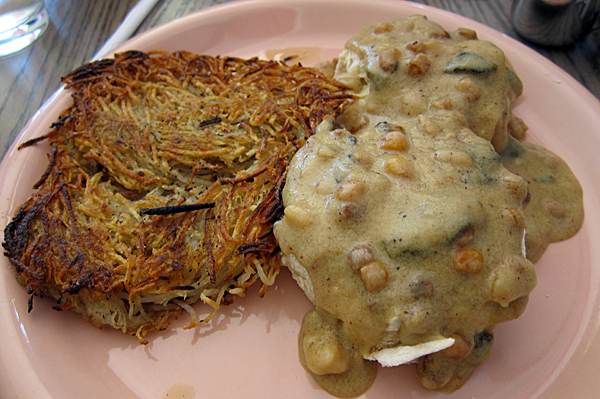 Of course, Austin has plenty of other vegan options to offer. We haven’t made it to Counter Culture since it transitioned from food truck to restaurant, but the food truck was pretty good. There are actually several vegan food trucks in Austin, but my attempts to visit them have been hit or miss. 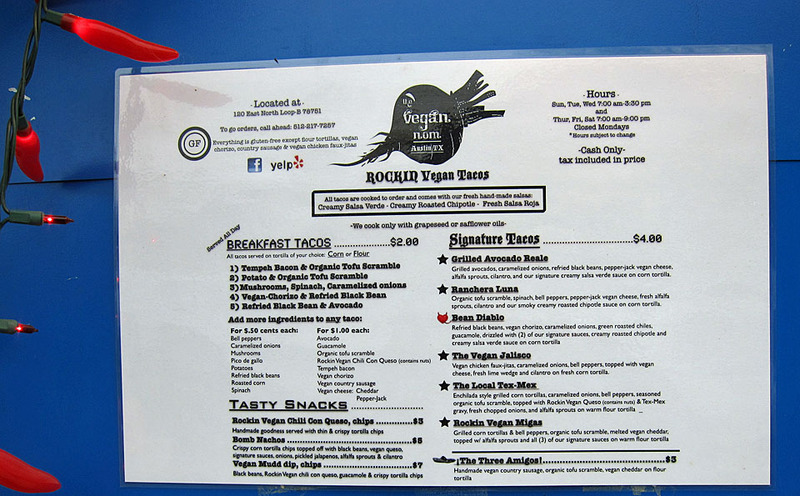 We found a vegan taco truck during this visit, The Vegan Nom’s Rockin Vegan Tacos, but unfortunately we had just eaten so I only took a picture of the menu. They’re on the list for my next trip! Also worth mentioning is Tacodeli. 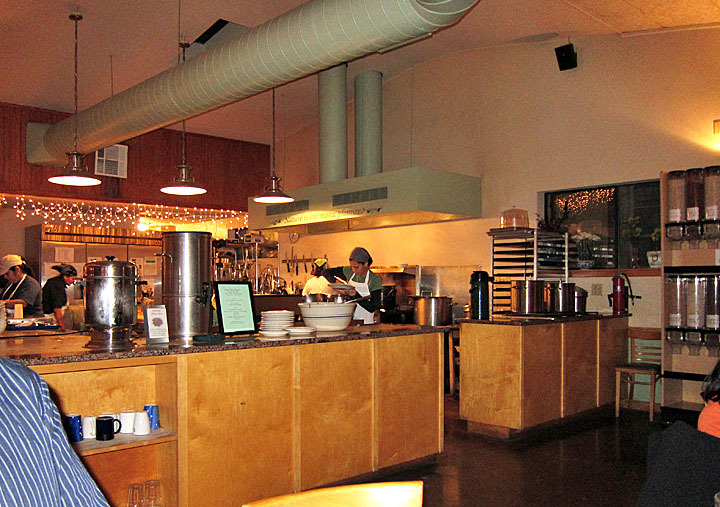 While it’s not a vegetarian or vegan restaurant, the menu offers multiple options for the herbivore. I had the Freakin Vegan tacos (sans avocado). They were pretty straight forward – black beans and salsa – but the hot sauce was great and it will certainly do in a pinch! 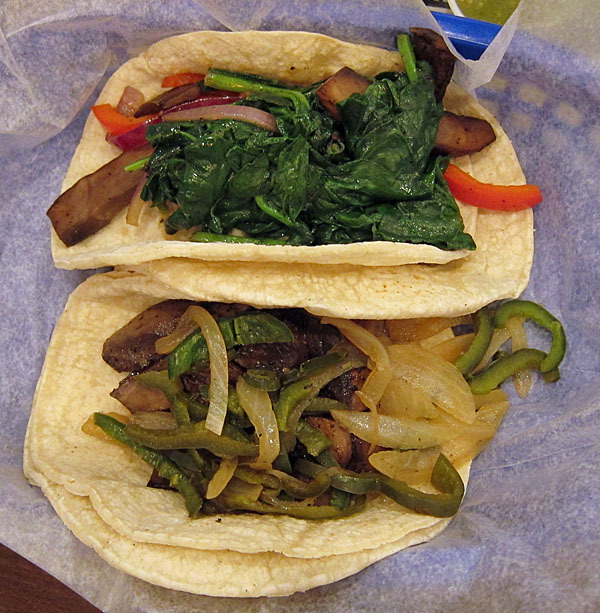 My husband was more adventurous and tried the Florentino and Frontera Fundido Portobello tacos, made vegan. He wasn’t too impressed with either, but he’s a native Arizonan. For him, no Mexican food from Texas will ever satisfy him, but that’s another story. 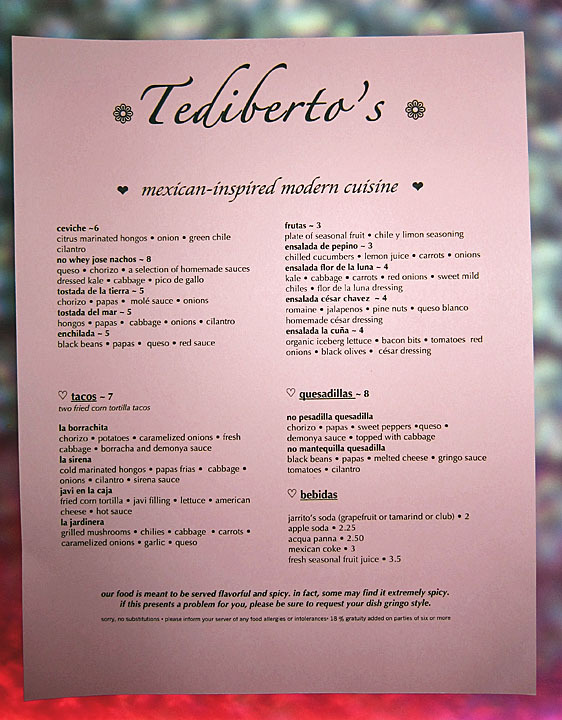 Tediberto’s , a new vegan and gluten-free Mexican restaurant on Roosevelt and First Street, has a unique vision. The restaurant presents patrons with a club atmosphere, and the late-night hours to match. 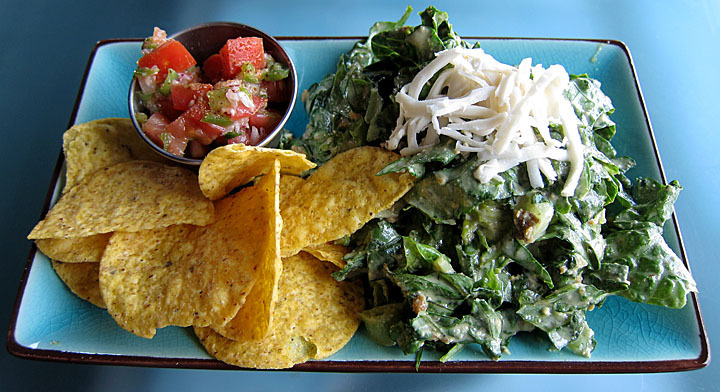 Tediberto’s offers an authentic craft cuisine that makes it distinctive both as a vegan dining experience and as a Mexican restaurant. 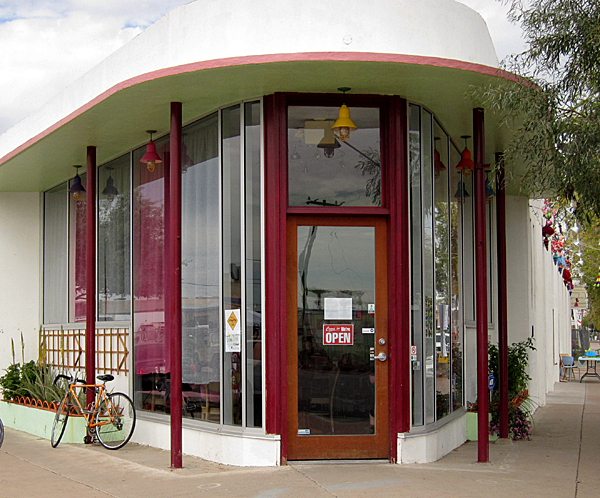 After much anticipation among Phoenix’s vegan community, Tediberto’s finally opened for business earlier this summer. We’ve made it there three times, and each time the menu had expanded and offered new items for us to try. The latest version of the menu has adopted a “tapas” approach, offering the widest variety of dishes yet. Rather than describing our experiences during each visit, I’ll just run through everything we’ve tried so far. I’ll start by saying that everything at Tedi’s is very spicy – which I love and appreciate, but it may not work for everyone. Items can be made “gringo” style, but even that has a kick to it. The No Whey Jose Nachos are a must try. We’ve had them twice, and they’ve been consistently good. The vegan chorizo is robust and spicy. Although I personally prefer a Daiya-style melted cheese topping on my nachos (okay, on everything), the queso provides enough of a gooey texture to satisfy the vegan cheese lover in all of us. 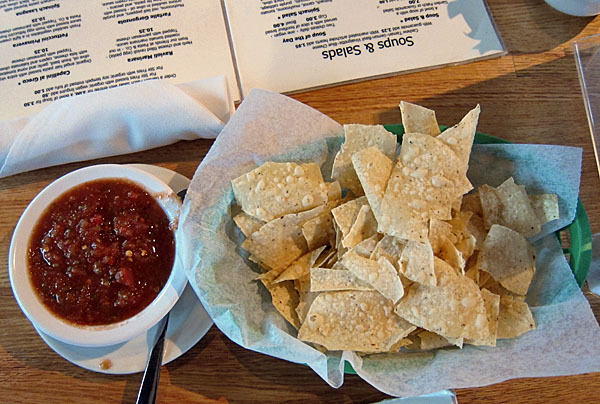 The chips and salsa are also excellent. Tedi’s salsa is fresh and full of chopped jalapeno. The chips are a bit generic, but more than substantial enough to support all the toppings. We were served salads on our first two visits, but for some reason, not on the third. The salads were different each visit – one was predominantly kale, the other was cabbage-based. The salads weren’t highlights of the meals, but they provided a nice mouth cooler after the nachos or chips and salsa. 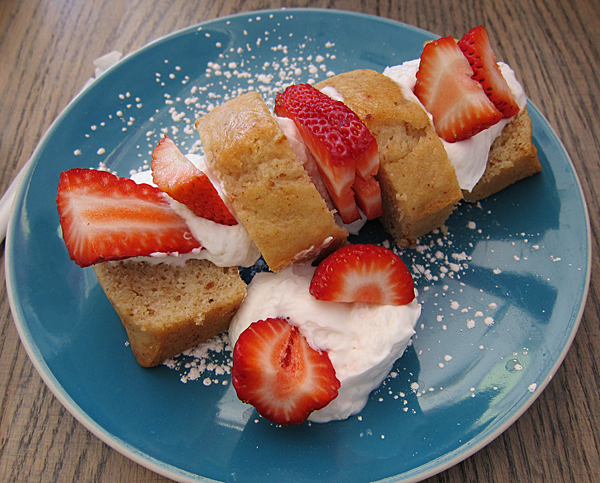 They also reflect the fact that the restaurant continues to tinker with its offerings. 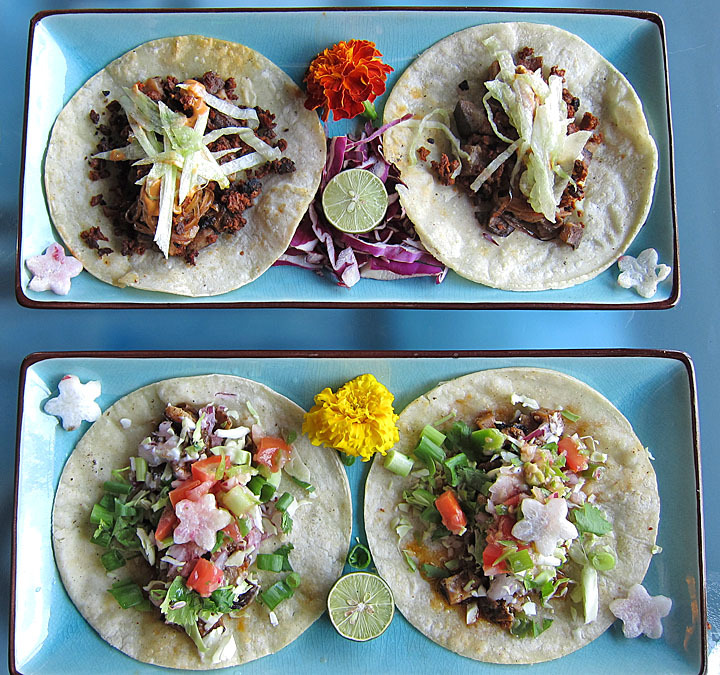 We’ve tried two different types of tacos – La Borrachita and La Sirena. 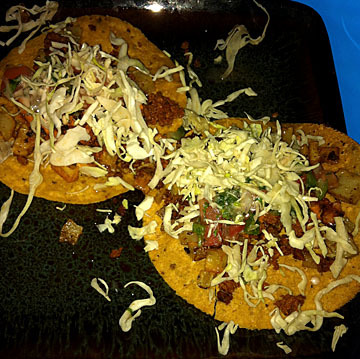 I highly recommend La Borrachita tacos, which uses the same delicious chorizo as in the nachos. 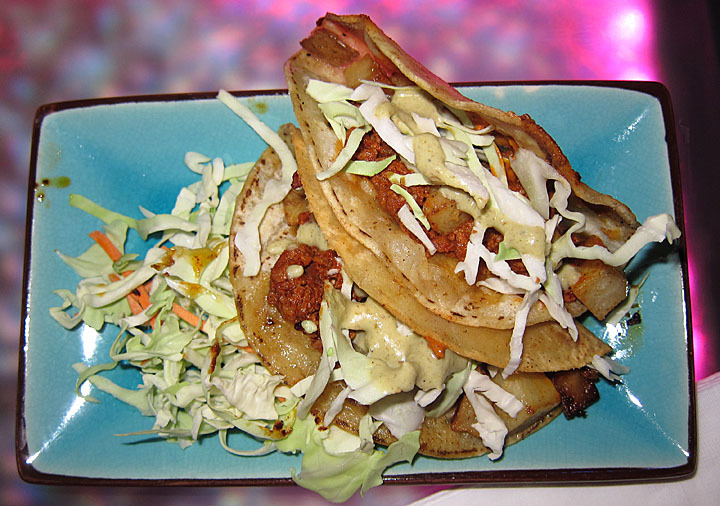 Meant to emulate fish tacos, La Sirena tacos were too bland for my tastes but they might be good if you are looking for something less spicy. 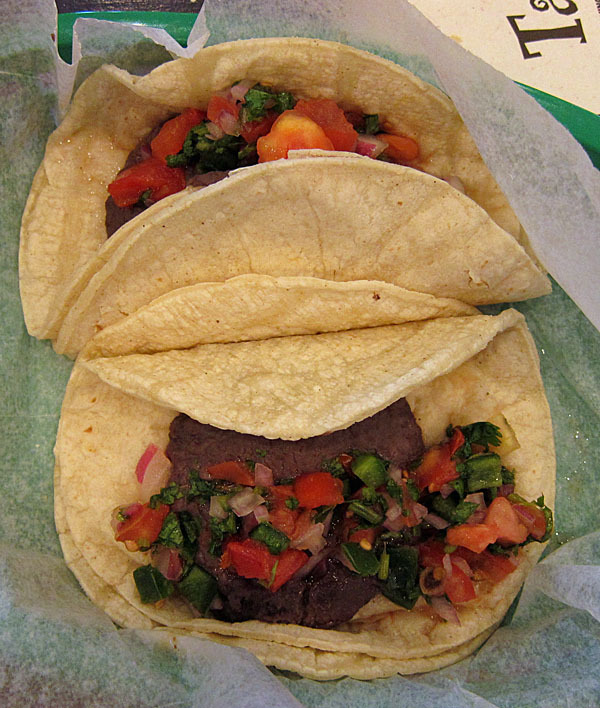 On the first and second visits, the tacos were soft shelled, but on the third, they were fried/hard shelled. I’d recommend fried if you are given a choice! 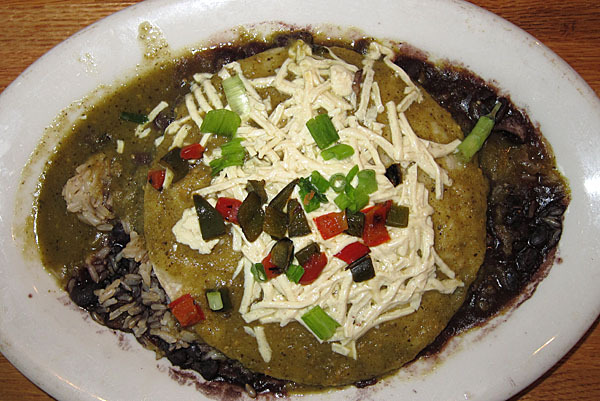 The Tostada De La Tierra is a lighter dish featuring a mild mole sauce. This one is probably another good option for the heat sensitive. 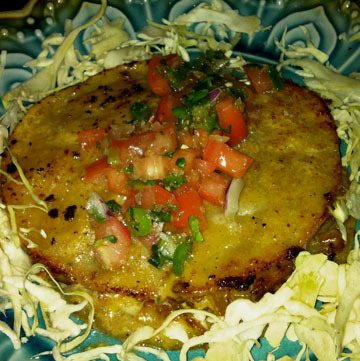 Another standout on the menu is the No Pesadilla Quesadilla. Gooey, rich and chewy (and based yet again on Tedi’s signature chorizo! ), this may be my favorite of their creations. I also tried the enchilada. I loved the unique rich red sauce, but unfortunately I was scared off by the chef’s “triple-Thai heat” warnings and ordered it gringo style. It could have been hotter for me. Next time, I plan to try it at full heat! Last but not least, Tedi’s touted their onion rings special on their Facebook page so I had to give them a try. 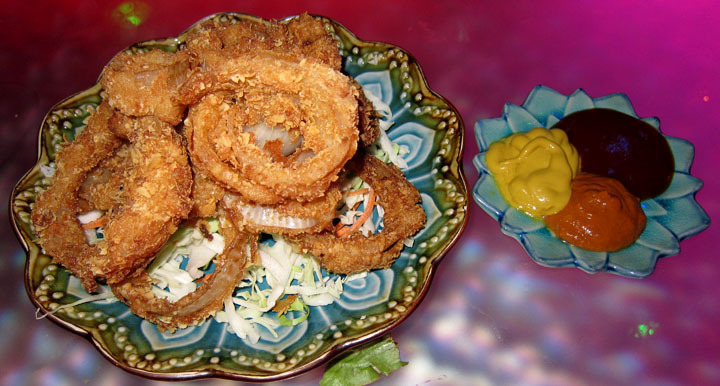 Vegan and gluten-free onion rings are not an easy trick to pull off, but these were great. The curried ketchup, chipotle and mustard dipping sauces were a nice touch. Tedi’s has the ambition and vision to become a staple in our dining rotation, and I’m rooting for them. But if you go in the near future, be prepared for a restaurant still in its growing-pains stage. The atmosphere is quirky, the hours are irregular and they continue to fine tune the menu items. Though they have attracted a dedicated following among the young club scene, they have a lot to learn about how to create an inviting dining experience for the average “off the street” customer. The staff at Tediberto’s has plenty of passion, youthful energy and enthusiasm. I really hope they make the transition from hip late-night hang-out to top-notch restaurant. I’d love to see Tediberto’s survive and thrive. 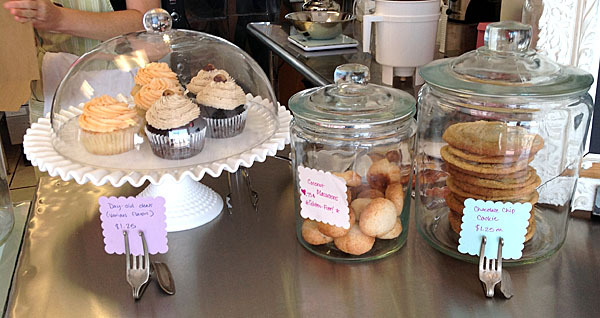 Treehouse Bakery’s Vegan “Pop Tarts” – the New Cupcake? Some people may think cupcakes are “all that” – but I’d like to propose a new pretender to the hand-held, single-serving treat throne: the glorious toaster pastry, aka the Pop Tart. The potential for inspired variations and flavor combinations is limitless. It’s time for Pop Tarts to go viral! When I became a vegan eight years ago, I thought pizza would be the hardest thing to give up. I was wrong. There’s plenty of excellent vegan pizza out there to keep me happy. However, two vegan taste sensations have eluded me over the years: frosted Pop Tarts and Cheese Doodles. But now, thanks to Treehouse Bakery I’m happy to say the splendor of frosted toaster pastry is back in my life. 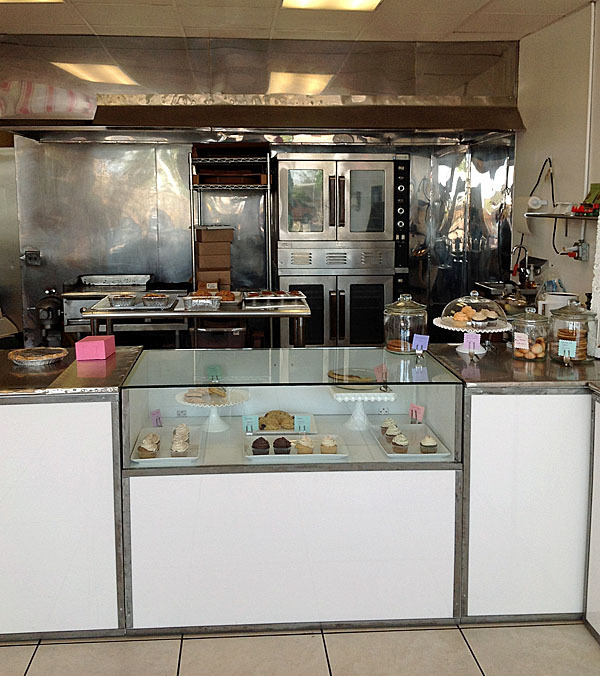 I had been looking for an excuse to visit the recently opened Treehouse Bakery storefront at the intersection of 15th Ave, W. Roosevelt and Grand Ave. So when proprietor and vegan baker extraordinaire Corianne Sizemore posted pictures of freshly baked strawberry “Pop Tarts” on her Facebook page, I was out the door and headed her way. The storefront is easy to find when traveling westbound on Roosevelt, and there’s plenty of parking. 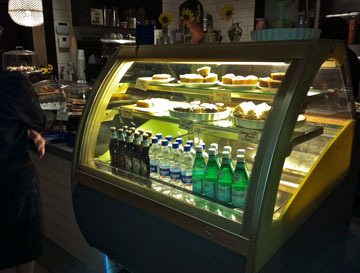 It’s light and clean inside, with the fresh-out-of-the-oven treats in cases or cooling on a rack. Of course since I was there already, I had to survey everything on offer and make some tough decisions. I’ve tried Treehouse’s vegan cupcakes plenty of times before (see previous review here) so I wanted to experiment a bit. 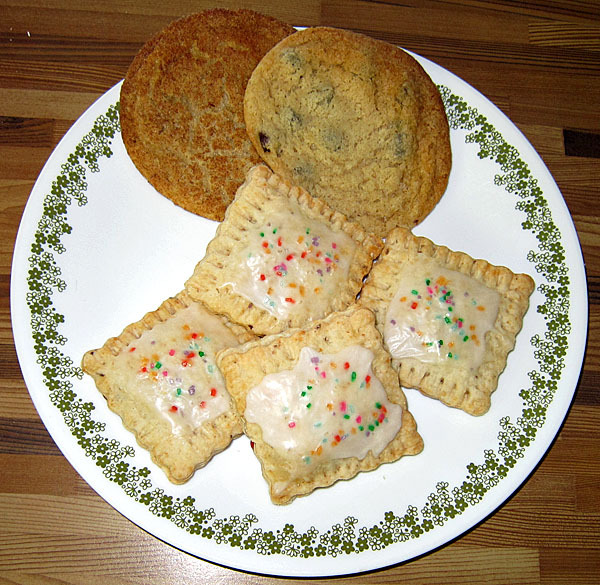 I ended up with the strawberry “pop tarts” of course, plus a chocolate chip cookie and a snicker doodle. The pop tarts were amazing. We toasted them to give them the “fresh out of the box” taste. The crust was flaky and slightly salty, and the strawberry jam was at just the right thickness. It isn’t a Pop Tart without frosting, and Treehouse’s were frosted to perfection. 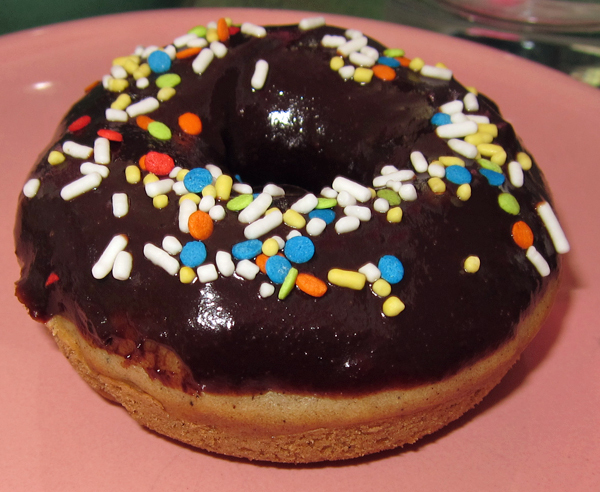 And of course, the rainbow sprinkles were the essential finishing touch. I want more. Now. Next up were the vegan cookies. Corianne apologized for the cookies being a little “flat” but they were just like I like them – soft, bendy and tasty. I couldn’t say which I liked better – they were both perfect. 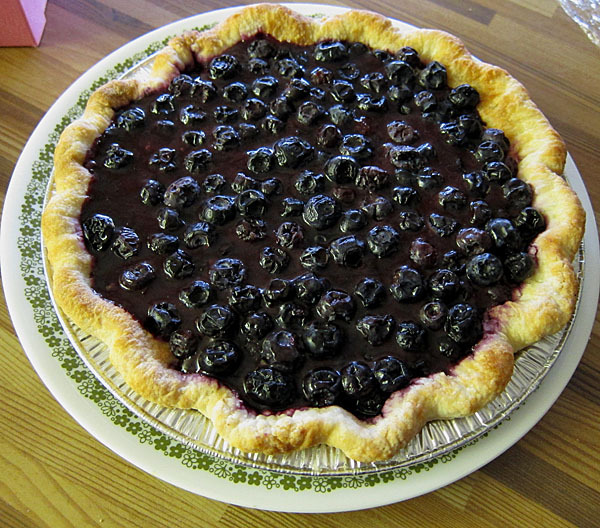 I also splurged a bit since it was a long weekend and picked up a blueberry pie. Corianne admitted up front that it hadn’t quite set (which is why I opted to buy the whole pie and not just a slice). It was pretty soupy, even after sitting in the fridge for a day, but the crust held up well. I’m afraid I’ll have to try a few more of her pies before posting a fair assessment of the Treehouse pie options. Now if only someone could come up with a good vegan Cheese Doodle, I’d be all set. 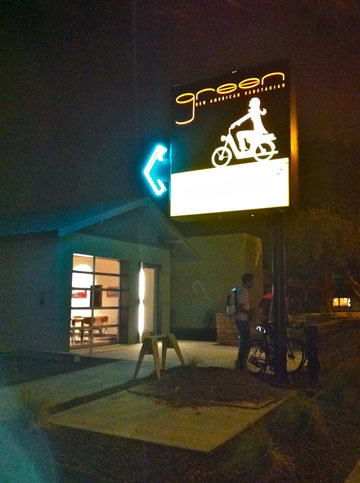 Lately, Green New American Vegetarian’s proprietor Damon Brasch has become the biggest vegan food-tease in the Valley via Green’s Facebook page. He’s driving me “specials” crazy. It’s bad enough that I crave Green’s thyme fries and spicy peanut chicken salad on a daily basis. And now that Green’s Phoenix location is 10 minutes away from my home and/or office, I go there far more than anyone should. But to make matters worse, Damon has twice the ability to tempt me to make an extra trip with his somewhat-weekly and always intriguing specials for both locations, which he teases his loyal patrons with on the Facebook page days in advance. Case in point: Damon posted last Friday that there would be new specials coming up soon. I hadn’t seen any posted over the weekend, but twisted my husband’s arm that we should go to the Phoenix location on Saturday to get salads, since we’d be “in the neighborhood.” While there, the person taking my order said they should have new specials on Monday. I had the day off on Monday for Martin Luther King Jr. Day, so beginning at about 10:30 a.m. I stalked the Facebook page to see what they’d be, hoping to go for lunch. By 1:15 I had given up, figuring “maybe Tuesday” and made lunch at home. At 1:30 p.m. The Teaser posted that the Tempe location has an amazing sounding special: “The 1970’s PO BOY- our tasty throwback Nature Burger patty with a tahini lemon dressing over fresh lettuce, tomato, sliced cucumber, and alfalfa sprouts. 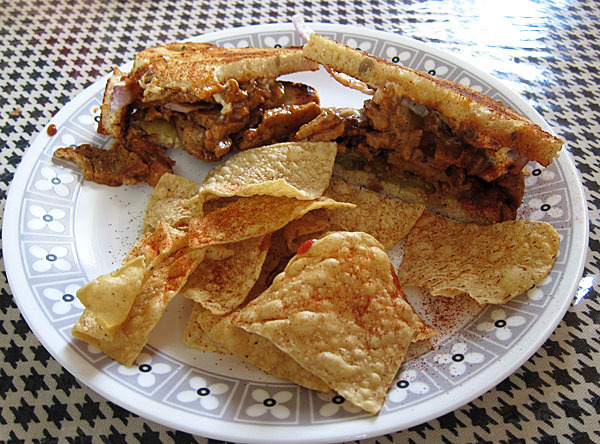 A bit of vegan mayo on a toasted po boy roll make this classic, one vintage sandwich – comes with a side.” I griped, and then realize I have a meeting tomorrow right by the Tempe location and can squeeze in a visit before or after. 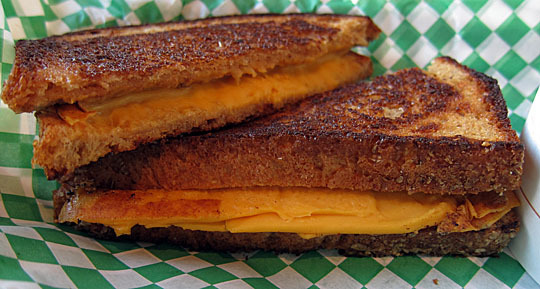 The bread was grilled perfectly – just greasy and crispy enough to give it some bite. The “cheese” was a bit dry/flavorless, but I think we all know that my penchant is for Daiya (which this wasn’t). I should have asked for pickles (which I always put on my grilled cheeses for some reason). The soup was spot on — tangy and robust, and given some extra boost by the pasta. 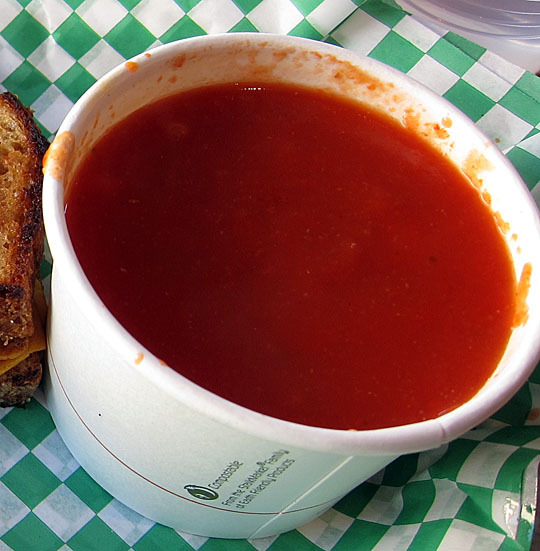 Once it clicked in my brain to dip the grilled cheese into the soup, my day was made. 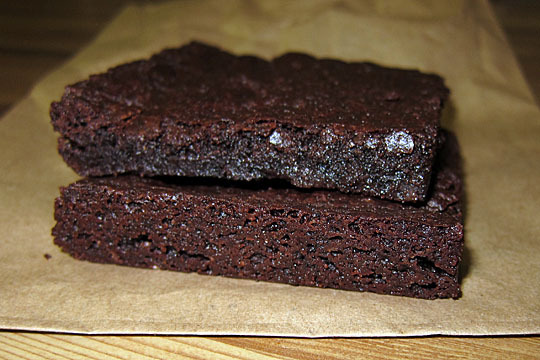 Of course while I was there I had to pick up a couple of brownies from Nami – which I swear are the world’s most perfect brownies (vegan or not). Crisp on top and on the edges, chewy inside, and with just the right amount of chocolate decadence. As to that special in Tempe, I’ll be trying it tomorrow for sure! Be forewarned that the best specials usually only last a couple of days. I’ve been burned too many times waiting til the weekend only to hear “we just ran out.” Get there soon! Special note: for those not “in the know” – there is an off-menu special that is always available and definitely worth trying – the secret wendy’s chicken (but I call it the Chick-fil-a because of the pickles). 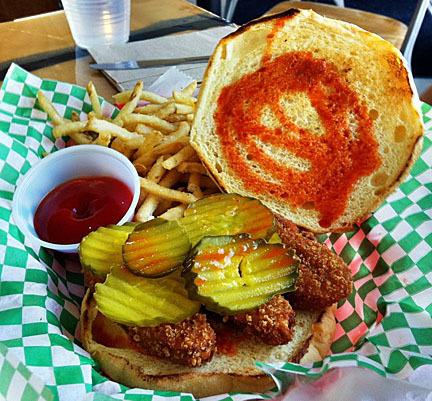 It’s fried “chicken” pieces with hot sauce, pickles and mayo (but I leave off the mayo). It’s become a regular for me (much to my waistline’s chagrin) – almost surpassing the no harm chicken parm or the secret bbq chicken sandwich. Nami! Green! Downtown Phoenix! It’s all happening! This is just a quickie in case anyone hasn’t heard the most exciting news to hit Phoenix in 2011. Both Nami and Green are open in the “downtown” location: 2014 North 7th St. Nami opened Friday, and Green opened today, on “World Vegetarian Day” – how fitting! 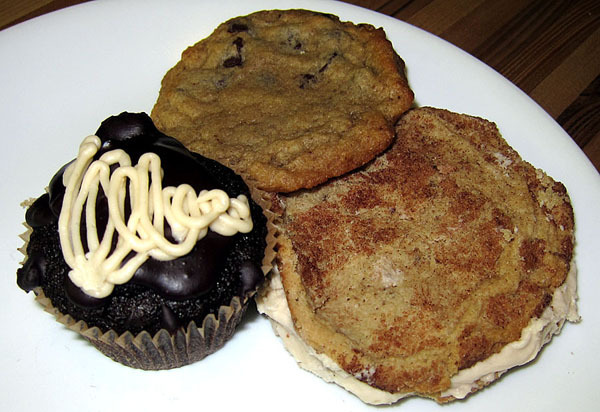 Nami features tsoynamis and delicious vegan desserts (cookies, cupcakes, etc.). 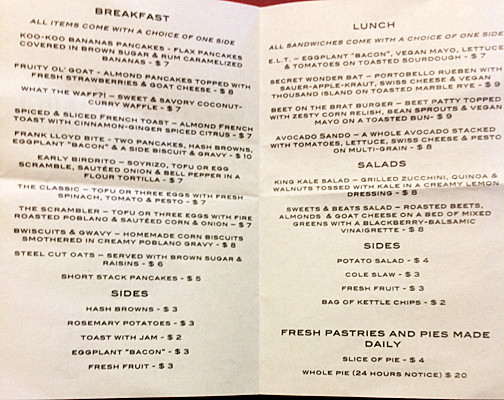 Green has the same vegan menu as the Tempe location. We popped in for dessert after having a Berkley Vegan at zpizza (because we didn’t know Green was open too!) and picked up a few treats to go. It doesn’t look the the Green/Nami websites are updated with info for the new locations yet, but the Green Facebook page should give you all the info you need. 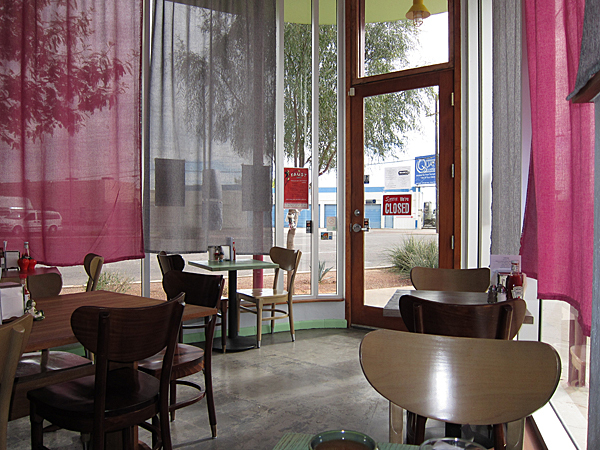 Nami is open Monday – Sunday, 7:00 a.m. – 9:30 p.m. but I don’t know the Green hours yet. Congrats to the Green team for making it happen!